After UNESCO voted to give the Palestinians full membership, the words of State Department spokeswoman Victoria Nuland contained a hint that the Obama administration at the highest levels is quite seriously concerned about the possible consequences for America of cutting off funds to the UN agency as required by Zionist lobby driven law enacted by Congress. (The U.S. funds about 22 percent of UNESCO’s budget or roughly $80 million annually; and $60 million was scheduled to be sent this month). Most of Nuland’s shortish statement would have been sweet music to the Zionist lobby’s ears. One possible implication of the words emphasized is that President Obama and perhaps even Secretary of State Clinton have looked into the future and realised that if America did default on its obligations to UNESCO, there could be moves to suspend or even expel it from the agency. Probably many misinformed Americans would welcome that happening, but it would be bad for America’s image in the world. The further implication is that President Obama is at least thinking about trying to persuade Congress to untie his hands on the matter of cutting off funds to UNESCO with the argument that it’s not actually in America’s own best interests to do so. In passing I have to say that I never cease to be amazed by the mind-blowing hypocrisy of almost all Americans in positions of political power. By far the most biased entity at the UN is the United States of America. 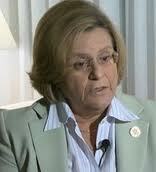 The Zionist lobby’s First Lady in Congress is the Cuban-American born Ileana Ros-Lehtinen. (Her maternal grandparents were Sephardic Jews from Turkey who became active in Cuba’s Jewish community. Her mother converted to Catholicism). She was the first Republican to be elected to the House of Representatives from Florida and she is today the chairwoman of its Foreign Affairs Committee. In that capacity she introduced the bill to cut off US funding to any UN organization that recognises Palestinian statehood. She also advocates cutting funding to the Lebanese Armed Forces and the West Bank and Gaza. Once upon a time it was only those seeking to be elected on the Democratic ticket who felt the need to kiss the Zionist lobby’s bottom. Now the Republicans are at it, too. What chance does any American president have of confronting this lobby in order to be able to put American’s own real and best interests first? My answer (I never tire of giving it) is no chance unless and until enough American voters are informed enough to call and hold their Congressmen and women to account. Ros-Lehtinen’s history indicates that she is a fan of targeted assassinations, so presumably on this matter she thinks Obama is doing a better job than George “Dubya” Bush. When a 28-second clip of her saying that was circulated on the internet, she denied it by claiming that the production team had misrepresented her by splicing clips to make the sound bite. Director Dollan Cannell then released the unedited tapes of the interview with her, proving that she had twice welcomed an attempt on Castro’s life. It was the production team that had been misrepresented by her, not the other way round. Cannel asked for an apology but he didn’t receive one. An inability to say sorry is, of course, one of the hallmarks of all who support Israel right or wrong. It is so sad that such a person represents Americans, even in Florida. How can someone having such extreme views be of any value in a democratic country? Now that Repugs are the majority, she has that exalted position in the Foreign Affairs Committee, where she can do maximum damage. This whole UNESCO issue shows the USA at its most small-minded, as it was obvious the vote would be for the entry of Palestine, so why vote against and have Victoria Nuland giving that pathetic explanation (luckily shown up by reporter Matt Lee)? It is ironic that the USA pretends to care about UNESCO, when it has no interest in education (see the Reps!) science (climate deniers, evolution deniers, fertilised-eggs as persons in the potential presidential candidates) or culture (look at Iraq, cradle of human civilisation now Burger King/Mcdonaldised)yet wants to influence it without paying. I stand corrected if wrong, but destruction of heritage as defined by and through UNESCO can in some circumstances also amount to a matter which the International Criminal Court may be seized of as well and accordingly be able to take action. Two further thoughts arising from the UNESCO vote. Firstly, how many of the 'abstaining' countries later vote for Statehood? Hopefully many - any ideas and reasons for them? I have not been able to find discussion on this yet. Second thought, it is a nice thought that the Bridge Complaint to UNESCO brought very recently by the PLO can now be brought by this long overdue new UNESCO member!! “I welcome the opportunity of having anyone assassinate Fidel Castro and any leader who is oppressing the people.” Would Netanyahu fit that bill since he is oppressing those under his military conquest. By the way calling her a lady is an insult to women. If she loves Israel so much, why doesn't she go and live there instead of giving US a bad name. "If she loves Israel so much, why doesn't she go and live there instead of giving US a bad name." Alan, you are so interesting! Keep up your drum beat on this important part of the drama in the mid-east and our dirty hands in Washington, D.C. Thanks for your truth, Alan. "When a 28-second clip of her saying that was circulated on the internet, she denied it by claiming that the production team had misrepresented her by splicing clips to make the sound bite. Director Dollan Cannell then released the unedited tapes of the interview with her, proving that she had twice welcomed an attempt on Castro’s life"
How America's gangster politicians DARE label anyone else terrorist, (namely Hamas, democratically elected government of Gaza), with potential criminals such as Ros-Lehtinan holding the position she does is utterly beyond me. It's not enough to air one's psychopathic tendencies to the world, but to go a step further and be dumb enough to deny doing so,knowing you were most likely caught on tape, makes Clouseau look intelligent!And these are the people who sit in judgement on the future of a Palestinian state. I don't think so. Ros-Lehtinen along with Canter should be arrested and tried for sedition as both have publicly proclaimed their allegiance to Israel over the United States even though they swore allegiance to the United States when sworn in as members of Congress. GReat information, Alan. A lot of Americans seem to think thyat the rest of the worl should serve their interests. Walking in a street with my daughter and her children in Texas when Gordon Brown was PM here I had a passer by on hearing my accent turn to me and say that it was Britain and Gordon Brown's fault that the dollar was weakening. Did she really think that foreign goverments woke in the morning saying ' what can we do for America today?' With attitudes like that endemic Ros-Lehtnian has got it made. Congrats to the Palestinioans - it is so rarely that we get a bit of good news regarding that area. thanks alan for all the work you have done to promote a better understanding of the israel-palestinian problem...where are your books sold in the middle east..lebanon and jordan...do you have a distributor or special arrangement with virgin for example..
Well it's obvious that this woman would be keen on killing "Castro". Who do you think the "Cubans" were who fled to Florida when he took over. Who do you think fled Bolivia, Venezuela and South Africa when they elected governments not friendly to the US? What do you think will happen in any of these countries when their leaders are defeated in elections? Why the parasites will be back of course. Heaven forbid they should go live in Israel when they haven't sucked all the other countries dry yet. Well actually South Africans have gone to live there but that's only until Mandela dies. After all whenever they flee they claim they have left with nothing and must go back to reclaim what's rightfully theirs. They lie to your face. They pretend Obama is anti Israel. The more they deny the more you know the truth. No Havanagila for them, just Hasbara. Seems to me that Netanyahu should live in the White House instead of ruling-by-proxy and Obama should erect a tent outside it starting an "Occuput the White House" movement.